TPMs provide an assessment of key capability values in comparison with those expected over time. 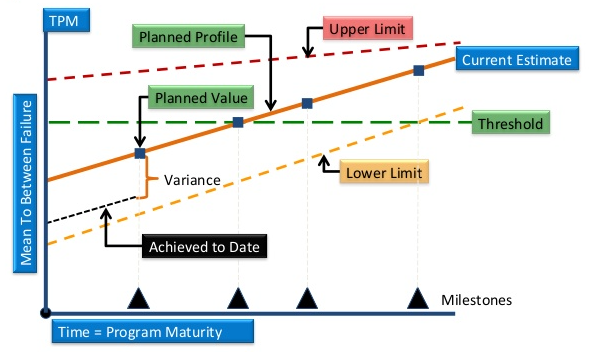 TPM is an evolutionary Program Management and systems engineering tool that builds on the three parameters of (1) Earned Value Management (EVM) and (2) cost and schedule performance indicators and (3) the status of technical achievement. By combining cost, schedule, and technical progress into one comprehensive management tool, program managers are able to assess the progress of their entire program. TPMs are typically established on those programs complex enough where the status of technical performance is not readily apparent. TPMs can also be valuable for Risk Tracking – levels below that forecast can indicate the need for an alternate approach. With a TPM program it is possible to continuously verify the degree of anticipated and actual achievement of technical parameters and compare with the anticipated value. TPM is also used to identify and flag deficiencies that might jeopardize meeting a critical system level requirement. Measured values that fall outside an established tolerance band will alert management to take corrective action. By tracking the system’s TPMs, the Program Manager and systems engineer gains visibility into whether the delivered system will actually meet its performance specifications (requirements). Beyond that, tracking TPMs ties together a number of basic systems engineering activities of Systems Analysis and Control, Functional Analysis Allocation, and Verification and Validation activities. Each parameter can periodically be measured and profiled to compare with predicted values and tolerances over the project life cycle. The most important process in TPM planning is the development of Technical Parameter Hierarchy, which requires the establishment of the Technical Performance Baseline. The technical performance baseline identifies all measurable key technical elements and establishes their relative relationships and importance. The hierarchy can be representative of the program, contract, sub-contract or other subset of technical requirements. The hierarchy must comprehensively represent technical risk factors associated with the project. Typically, the highest level of the hierarchy represents system level or operational requirements with subsystem level requirements underneath these as lower level parameters. This form of TPM methodology not only serves internal tracking by the systems engineer but also adds visibility of program status reporting.